I wore my paisley patterned Zara silk tunique for a trip to the beach today. Scarf tying method: basic bias fold wound once around the neck, ends secured with a shawl ring in a vertical basic slide. 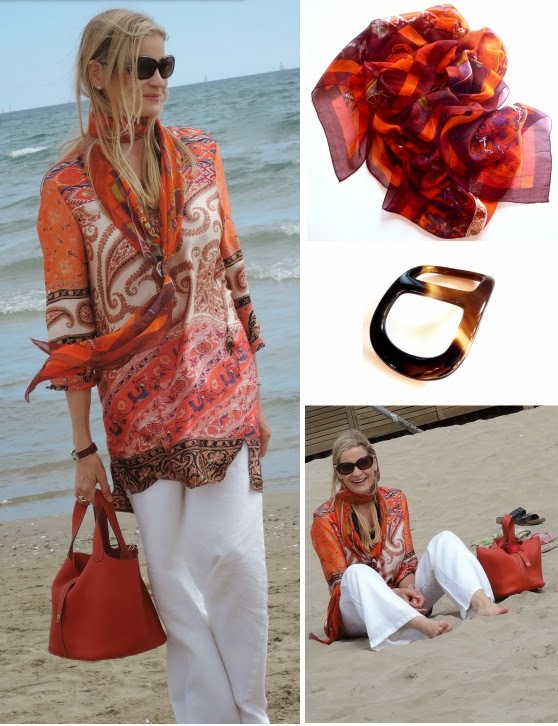 You always know how to pick up the right items and combine them so beautifully with Hermes scarves and bracelets. DS has become so tall! How amazing! He is a such a handsome boy! Can't wait for your next post and more gorgeous pictures of you and your holidays! you look beautiful as always. Got to love the beach! You look so happy and relaxed. I am enjoying seeing your scarf+patterned tops combinations. Beautiful pictures and colors! Enjoy your week dear MaiTai! Hope you had a lovely week too, and have a great weekend! Thank you so much for sharing MT, what a pretty look. Have not checked in with you for some time, since we have been on happy hols, cycling in the beautiful Derbyshire countryside (I recommend), time off together in London, and seeing friends and family in Surrey and Sussex … so I can't wait to see you UK journal … we've been fortunate with lovely weather this summer. Thank you for the restaurant recommendation - I always note your recommendations for my travels and much appreciate the tips. Love your outfit, you look wonderful. Enjoy the remainder of your summer, and I hope to have some time to check in more regularly. Thank you again for your blog, a source of constant inspiration. So nice to see you again, dear S! Great to hear you had a wonderful summer, and how fun we’ve done so many of the same things (with the exception of cycling in Derbyshire.. which sounds great fun). A happy remainder of the summer to you too, and hope you’ll like the UK posts to come. London’s next! Love your colour combinations and also seeing you look so happy and relaxed. Stunning post and love the color, you look very chic in your coral tunic......enjoy! Happy you enjoyed the post. Longing to see some white and blue, will pop over to you in a sec! DS is growing by leaps and bounds and looks as if the summer break has agreed with him...full of boundless energy and all! Votre ensemble était magnifique et cette couleur vous va parfaitement bien. 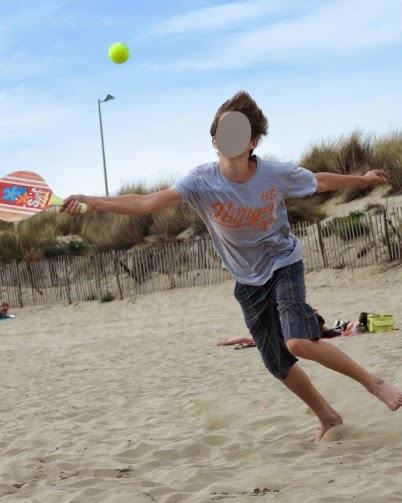 J'adore la façon dont vous mariez les couleurs, à la perfection !! Les photos donnent bien envie, vu le temps qu'il fait dans le nord ouest...il pleut !! I have been adding comments for quite a post but as the net moves in misterious ways they have all dissapear !!!!! I love your pics from UK, nothing compares to the beauty of the English countryside in summer... I consider England my "heart land".. my first husband was from there and I used to sepn the summer season in Kent and Oxfordshire.... Oh to be in England !!!!! BTW Have you see anything from the FW collestion???? I can't wait to see some of them IRL... As always your wisdom in these issues will be more tan wellcome ..
ITA w/Pam: I too, like the patterned tops with scarves. Beautifully done, dear. Love that Zara tunic, almost as much as your TB one in pink/gray/off white. So nice to see you enjoying your day at the beach. Also, I cannot believe how much DS has grown! It’s been such a lovely day. The trousers are my beach staple, happy you like them! And is taller than me by now…as you say, crazy! Amazing your linen pants are not much wrinkled even after walking and sitting on the beach! What brand is it? These pants have been good to me! I bought them about ten years ago, from Apriori. I sooooo regret not buying this tunic when I saw it in the shop! I thought it might look cheap on but obviously I was wrong! Thanks so much, dear Penney! Mai Tai most of your abreviations I unfortunalety do not understand.